Allende is a private luxury yacht charter for bespoke, all-inclusive vacations for up to six guests. The yacht reflects the owners elegant design aesthetic accentuated with the best of their travels to date. They specifically chose the Fountaine Pajot Helia Evolution for her light-filled interior and thoughtfully designed floor plan. The yacht offers a balanced mix of private living and social spaces for couples, families, and groups of friends. The salon doors slide away to connect the outdoor dining area and the interior salon. Seamless windows provide 360-degree views of the islands around. The common areas aboard Allende are inviting and uncluttered. The outdoor deck areas offer a mix of sunny and shady spots for relaxing, and guests love the panoramic views from the fully cushioned rooftop lounge. Meals are served al fresco at a teak dining table on the aft deck. The floor plan boasts three beautifully appointed, private staterooms for guests. Each cabin features a queen-size bed and an en-suite bathroom with electric flush head, separate shower, sink and vanity cabinet with mirror. The Helia Evolution showcases redesigned portholes in the cabins which increase natural light while maintaining privacy. Guests fall asleep on 400 thread-count Egyptian cotton linens topped with a cotton coverlet. Fluffy white towels for bathing and quick-drying Turkish towels for the beach are provided. Additionally, each cabin is fitted with individual A/C controls, an 110V power outlet, two reading lights, a fan and ample closet space and storage. Crew is PADI Open Water Certified, with plans to advance their certification. They cannot lead dives from Allende, but do enjoy diving and would be open to joining our guests on rendezvous dives as their schedule allows. Graham is an engineer by training who spent a successful 10-year career in the oil and gas industry. He learned to sail on a 20ft racing dinghy with Kristiann as crew. They raced weekly for several years, topped the local podium and earned the chance to compete internationally. If you are new to sailing, Graham would love to teach you how much fun it can be to helm and tune the sails. He knows the islands well and can craft an itinerary that suits everyone aboard. When the anchor is set each evening, Graham turns his attention to crafting cocktails to your taste. From 2011-2015, Kristiann ran a successful catering company. She honed her culinary skills by accommodating a wide variety of preferences and dietary needs each day. She loves to combine gourmet ingredients with local delicacies for new twists on classic dishes. Avid travelers, Kristiann and Graham have lived on four continents and visited over 40 countries. Their experiences have taught them that great vacations are made up of many small details. Kristiann delights in tailoring the menu and creating special moments for each group of guests aboard. In 2015, Graham and Kristiann reached a point where they could focus on what they love to do most: travel, host guests, and sail. They have sailed Allende since her launch in France, cruising the Bay of Biscay, Mediterranean Sea and crossing the Atlantic to meet you in the British Virgin Islands. Both Graham and Kristiann hold a Masters 50-ton license from the United States Coast Guard and are CPR/First Aid certified. Graham and Kristiann welcome you to share in the luxurious life aboard Allende. Friday is a seven-year-old German Shorthaired Pointer with his sea legs. He´s well-mannered and loves the water. He leaps off the front of the boat when at anchor and seduces other cruisers paddleboarding by to take him for rides. Friday can climb the swim ladder on his own. For guests who are pet-lovers, he is a much-loved addition to their charter. With advance notice, the crew is also happy to confirm Friday´s home ashore. Offer: Special offer for bookings from June 16-28: 9 nights for the price of 7 nights. Send us an inquiry to get specific pricing for Allende. After 20 years of marriage and many adventures this was the perfect celebration. I am amazed at how much we were able to accomplish in seven days. Your home is so beautiful--thank you for the memories. An absolutely fantastic crew in every way! We´re so thankful to have found the Sail Allende team. We just returned from a week´s sail where Graham, Kristiann, and Friday (the crew dog / entertainment crew) treated us to the best time in the USVI/BVI. Pre-trip communication was professional and timely. Allende is kept in fanatical shape. Graham is careful and professional at the helm. And Kristiann kept our bellies full with delicious cocktails and the most 5-star amazing food. As a chef, Kristiann doesn´t skimp - nearly everything is homemade aboard and suited our diverse group´s taste buds. The Sail Allende team created a customized journey for us. We can´t say enough about this crew! If you´re looking for a crewed charter, look no further. We promise, you won´t be disappointed! We can´t wait to be back on Allende for BVI 3.0! We will never forget you or this unbelievable trip! Both of you are fabulous hosts, Captains, chefs and now friends. Every day, night and minute was beyond my wildest expectations. Thank you for helping me out of my comfort zone and take this experience fully on. I swam with a shark, over a shipwreck, dove for conch, fished in the deep blue and explored the BVI by moped thanks to you both. We will definitely hold our 15th wedding anniversary close to our hearts. Thank you for this gift! This was hands-down a once-in-a-lifetime trip! The words ´thank you´ don´t even seem appropriate! The food, hospitality and attention to every detail was above and beyond the call of duty. Your knowledge of the area, fantastic advice and stories added such a personal touch to our experience. And the amazing Bushwackers didn´t hurt! You have catered to our every need and truly spoiled us! This was an amazing vacation for our family! Thank you so much for everything--from the incredible meals (and I mean every single one!) to the amazing adventures each day. It´s going to be an adjustment to go home and have to do anything for ourselves. Never have we ever eaten such fine food, meal after meal, day after day and never have we ever witnessed such rare natural beauty, reef after cove after mountain after bay. This past week has cleared our minds and filled our souls. You are gracious hosts and patient teachers. All very much appreciated. Sail Allende!!!!! 5 Stars---All the Way!!!! 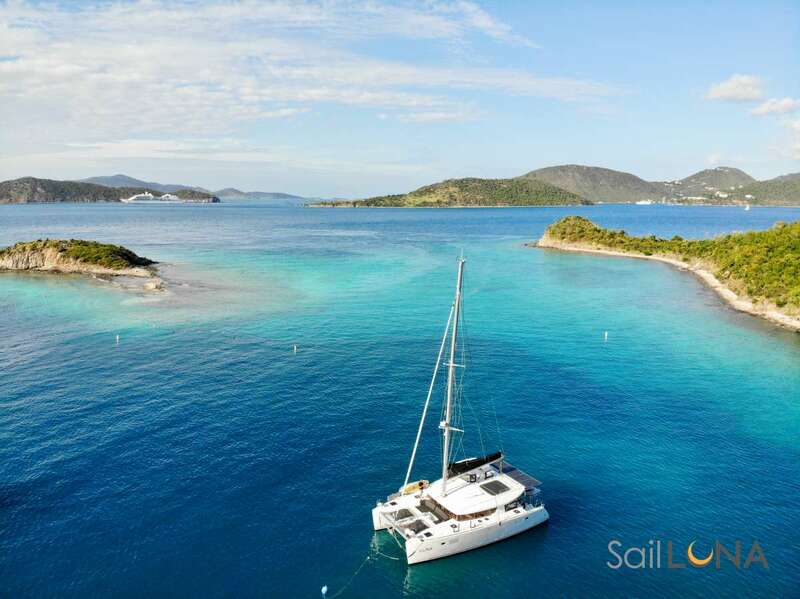 I wanted to reach out to you and thank you for your help setting up our first and BEST sailboat trip in the BVI´s. I can´t explain how magical and perfect our trip was!!! The catamaran was amazing, but no matter how the boat was, you can never replicate the crew! Kristiann and Graham were soooo key to our trip being perfect, fun and delicious. The service was by far better than any luxury hotel I´ve stayed in. They both were low-key and accommodating, and sooo organized and prepared to supply their guest with the best of the best. I HIGHLY recommend making Sail Allende your first choice when a potential customer asks for your ´opinion´ as there are many boats/crew to choose from. This trip touched my soul! I feel like I´ll need to sail at least once a year, and I will only sail with Kristiann and Graham. They have a loyal following with me and my husband! Truly epic and remarkable experience thanks to them and their perfectly designed and well-maintained boat along with their 5-star meals, coffee, drinks, and appetizers!!! To say that Sail Allende is exceptional is a huge understatement! One goes on a trip or has an experience they always seem to find something to improve on....but, honestly, I´m unable to find anything. They manage to hit every check box and as far as I´m concerned, they set the benchmark for quality service and crewing a catamaran. Excellent, knowledgeable Captainship, incredible 6-star gourmet cuisine (ALL made from scratch in a small ship´s galley), deep knowledge of the area with excellent sightseeing, and kisses on the nose from their dog Friday...all make for a ´trip of a lifetime´ we plan to recreate over and over...thank you Kristiann and Graham! Super fun-filled week. Excellent food, sailing and water activities. The best trip ever and we´re ready to do it all again! One of the best trips ever! The food was fantastic and we always felt we were in the hands of an experienced Captain. Each meal, beach, port-of-call was exceptional. Can´t wait until we can return. You checked all the boxes! A perfect balance of professionalism and down-to-earth friendliness. Incredible activities and relaxation, all topped by the best eating I have ever experienced. Truly over the top! The entire trip was perfect from start to finish. This would not be a complete entry without expressing my utter gratitude for the vegan cooking on my behalf--beyond my expectation. Graham and Kristiann--thank you so much for everything you did to provide a great trip. Awesome. The whole thing! The BVI, the company, the boat and of course Graham & Kristiann--they treated us like honored guests. A week of perfection. We cajoled friends for two years to make it happen. Can´t say what was our favorite part; the bays, sailing, snorkeling, excursions and FOOD were all first-class! We can´t wait to come back. Thank you for showing us the best of the Caribbean, creating a beautiful experience for us and giving us the best culinary creations ever! Tom & I had bragged to our friends about your knowledge, culinary skills, sailing ability and all-around greatness! And you both delivered. The BVIs have returned and we loved doing a new itinerary, full of fun. It´s been wonderful to see the recovery and to see the people so happy. Thank you doesn´t seem like enough! We loved being with you both all week! You then exceeded even my greatest expectations! Our first thoughts once we boarded were, ´This is going to be the best vacation we´ve ever had.´ You then exceeded even my greatest expectations! Food was amazing--who needs to eat ashore? My first time snorkeling and paddleboarding and you made me feel so comfortable doing it. Getting to help raise sails and participate made me feel welcome as a new sailor. Locations were breathtaking and just the right amount of activity vs. chill. Loved the morning kisses from Friday--he is the sweetest dog--and we felt right at home with a dog aboard. Thank you for an amazing week! We all agreed that our week with Graham and Kristiann on Sail Allende was the best sailing trip we have had, despite our two boys being committed monohull fans! Specifically, G&K are enthusiastic about sailing so were happy to blast around as much as we liked. They allowed our involvement and were helpful with tips and instruction. G&K took turns to snorkel with us, being wonderful guides and spotters underwater. Catering was fabulous. Their professionalism and attention to detail was manifest in everything they did and included some lovely personal touches. They have given each aspect of hosting serious thought and none of us could find fault with a thing. Perhaps the best way I can communicate it is to report what I said to them: not only could I not find fault, but I could not come up with a single thing that I think they could do better, they really were that good. Sailing, itinerary, friendliness and discretion (and getting the balance), ideas, organization, catering, drinks and refreshments etc. It was terrific. Awesome boat with the best crew! figure out how to book the next trip. This trip is full of memories we will cherish forever. Thank you so, so much for an amazing week, and for the passion and love that you put into everything you do. Sailing is a surprisingly hungry business. So in addition to three meals a day, you’ll find snacks delivered just when you need them. Start your day with coffee from Allende´s professional-grade espresso machine.Breakfast is accompanied by coffee, tea or juice and your choice of a tropical fruit smoothie or fresh fruit platter. A cold breakfast of Greek yogurt with homemade muesli, honey, and homemade preserves is always available. Caramelized carrot soup starts this three-course dinner. Chef Kristiann loves to prepare vegetarian meals as well and can accommodate most any dietary requirement with advance notice. Juice, sodas, water, beer, rum punch & well drinks are available all day for your enjoyment. Spirits include Tito’s Handmade vodka, Tanqueray gin, Jack Daniel’s whiskey, Jose Cuervo Gold tequila, local rum, and an assortment of liqueurs. Please remember to let us know your preferred brands. If you prefer premium wines or spirits not included in the list above we will be happy to stock them for you at an additional cost to the charter.